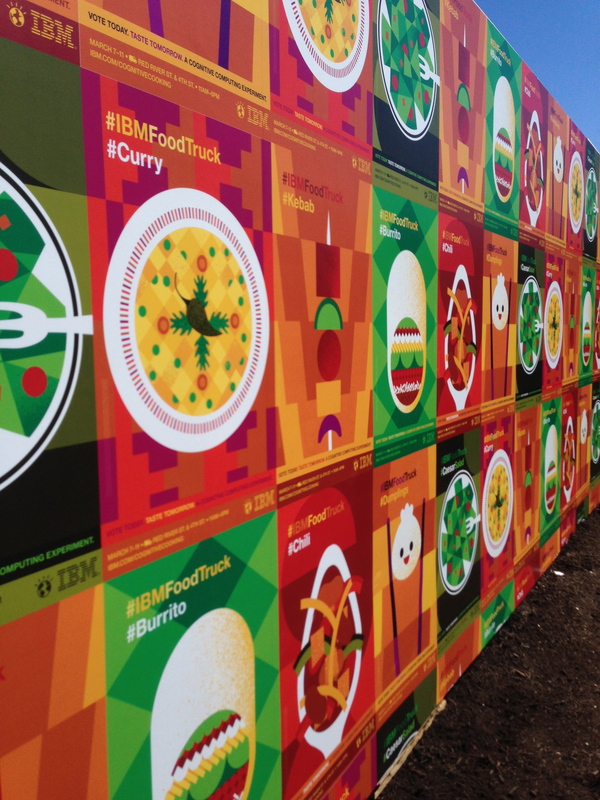 One of the most impressive displays of data driven innovation and equally of the best stories of social media campaign hacking at SXSW 2014 came from IBM’s Cognitive Cooking efforts. This was a menu created with the help of Watson – IBM’s renown self aware computational genius of a computer. IBM input the chemical food structures of over 10K foods (or so I was told at the food truck). Watson then matched foods coming up with new combinations based on flavour profiles. Now add a partner like New York’s Institute of Culinary Education – who took the new favourful combinations and made a menu. 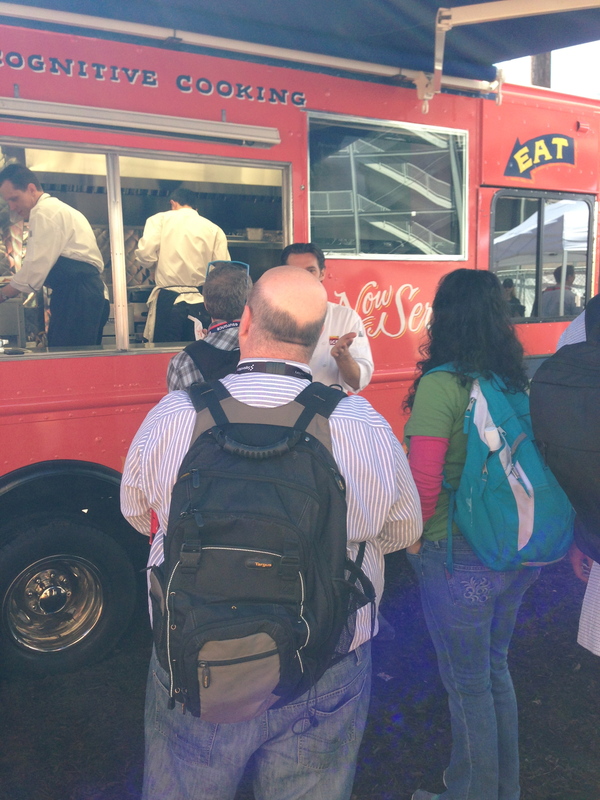 On the day that I was sampling the #IBM Food Truck Fare, I interviewed the chef to understand if Watson’s involvement took away any of his enjoyment. The chef revealed that whereas Watson recommended the food combinations, the computer did not give a recipe, amount of ingredients to be used relative to other ingredients nor information on how to prepare the food. And so he felt there was a lot of territory to explore as a chef. With that, he gave me a sample of Peruvian potato #poutine. Talking to a few IBMers at the booth – I learned the onslaught of Montrealers was no accident. 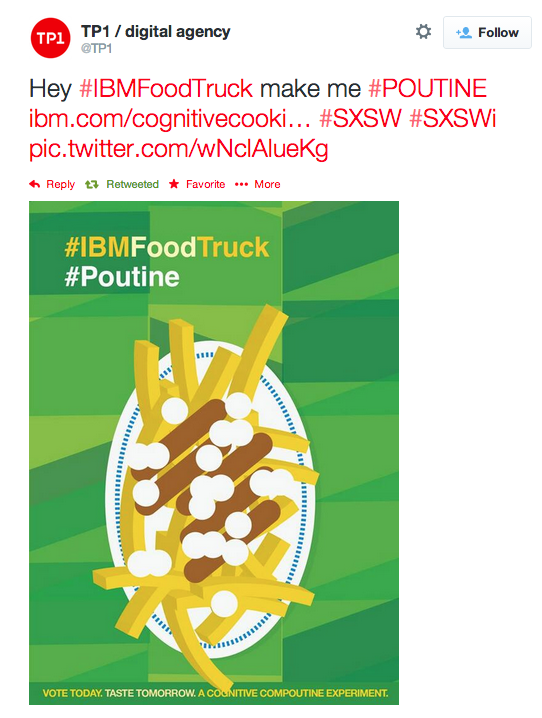 Having #poutine on the menu was a beautiful hack to IBM’s cognitive cooking campaign. You see – to add a layer of social activation for SXSW, IBM marketed the six menu choices, each with their own poster, and encouraged South by Southwesterners to vote by hashtag on what menu they wanted for each day. That’s where @TP1 and @NVanderv enter. They created their own ‘fake’ poster, entered it into the socialsphere and voila! They gained so many ‘votes’ that IBM agreed to make #poutine. If you can read French, this is really explained much better in the Minimal Blog “Informatique cognitive et fromage en grain”. Anyhow – I just love how you can create a campaign but the audience might take over – in a hack that is so much more than IBM could have ever planned. 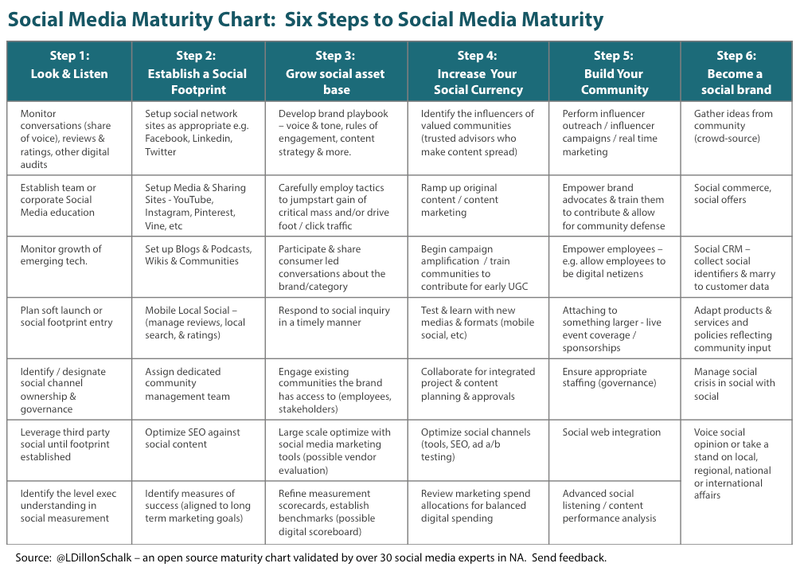 This entry was posted in big data, IBM, influence, social networks on April 27, 2014 by Laurie Dillon Schalk.